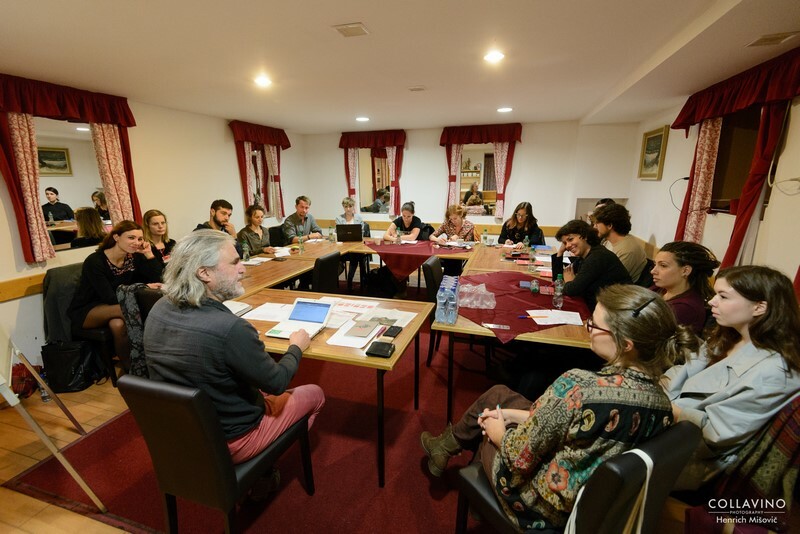 The first meeting of the Audience Programme Board took place on 12 March at the Andrej Bagar Theatre in Nitra. The members were offered a look behind the festival scenes by festival director Darina Kárová, learned about the Be SpectACTive! project and their respective roles and had the chance to meet each other as well as members of the festival staff. Be SpectACTive! is funded from public resources by the EU’s Creative Europe Programme and the Slovak Arts Council. In the second stage of the Open Archives project, the Association will focus on mappingthe most important events in the festival’s accompanying programme and its other projects, including Parallel Lives – 20th Century Through the Eyes of the Secret Police, This Is Art, Too, V4@Theatre Critics Residency, How to Understand Theatre, A Tulip for You. The second stage will also see the finalisation of the digital video archive and other activities. In due time, we will also launch an English version of the DN Archives website. The Open Archives of Divadelná Nitra (research → reflection → research) project is supported by the Slovak Arts Council, the main project partner. A remarkable personality, director and actor. His productions regularly earned him awards at many local and international theatre forums. We were fortunate to witness his extraordinary work at the International Theatre Festival Divadelná Nitra in 1995, when he staged his production of Chekhov’s Three Sisters. The passing of this unique artist will be a loss deeply felt by the international dramatic community. Our most sincere condolences to his relatives, colleagues, co-workers and friends. 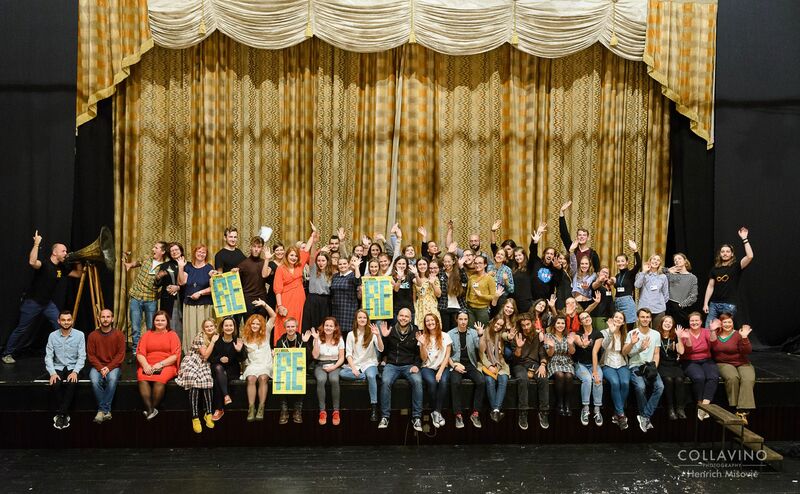 We want to thank all those involved in the organization and realization of the International Theatre Festival Divadelná Nitra 2018 - who have prepared, supported, provided a patronage, financial support, materials, media, personal and moral support and - last but not least - those, who participated in its rich and diverse programme. And also we want to thank all who honored it with their visit. Take a look at the festival through a few numbers in the EX POST Divadelná Nitra 2018 document. 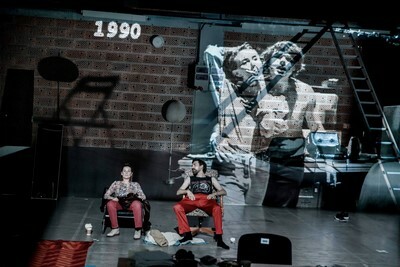 “With the playing company, accustomed to create non dramatic situations on the stage in a way that is so exciting for the spectator, the director and his team created the fascinating stage work, which competes in its innovation with Knausgård's novel,” says Ján Šimko, one of the curators of the Divadelná Nitra programme. "Borczuch does not bring a classic drama on the stage, but with a help of elements and formal innovations of the novel creates the production, where by theatrical means asks those questions, which cannot be asked by the novel,” he continues. Karl Ove Knausgård, on many pages of his extensive fresco, literally describes even the most trivial acts of cleaning, shopping, feeding children, or a regular phone conversation. Such an attempt to grasp the life that escapes from the man has become almost instantly a literary sensation. Perfect authenticity of the most intimate details, however, inevitably led to that fact, that Knausgård sacrificed his own interpersonal relationships, including a family. "Others can be very close to us, they can be part of the family, but when confronted with our ego, they are reduced to characters in the novel," says the director of the production Michał Borczuch, who, while adapting and staging the work, logically tried to work with everyday situations and, at the same time, experimented with a theatrical form. "Knausgård appeals to us to produce literature from our lives. But here is a paradox: when our life becomes more significant, any other life – even if it is presented in minute details – becomes anonymous," he continues. Based on a literary text so focused on the self-exploration, My Struggle eventually tells about the tendency of self-representation and the closely related loss of privacy that accompanies lives of individuals on social networks. The inclusion of the work in the Divadelná Nitra programme clearly shows, how the most meaningful festival of performing arts in Slovakia examines, records and anticipates the state of society in its programme. Within the thematic play with prefixes and syllables, the festival attributed the term REminiscence to the production. "The staged version of My Struggle is about our desire for normality, for the real life that we are looking for in more or less masked fiction," wrote Witold Mrozek, a leading Polish critic in the review for Gazeta Wyborcza. According to creators, night is time for outsiders. And production, in a very expressive way, is telling the story about people, who cannot or do not want to belong to the society that lives during the daytime. The types created by Portuguese artists have already resigned to find their place in society. "The trio of outsiders encourages spectators to be silent for a while: It's night, forget for a while about time, we can dream, imagine. We are watching their nightlife, the outer and inner world which surround them, and to which the magical power of the night gives an extreme form," wrote in the festival catalogue Dáša Čiripová, one of the curator of the main programme. Performers show huge physical power, on the border between dance and theatre, in the arena full of tires, they move almost in the dark. Viewers sit right next to them, within striking distance, and a direct mutual contact is seen on the stage. During the whole performance André mixes the dynamic musical range live on stage and co-creates the ever-present vibe and tension of the night street. The production draws inspiration from the work of the remarkable Portuguese poet Al Berto. A duo of creators founded Circolando in 1999, the company is set up on the premises of a former factory in Porto. They consider inter-genre connections to be the dominant feature of their work, they seek to do a dialogue between dance and theatre and, at the same time, use poetry, fine arts, music and video. The basis for the satirical production is extremely simple: while the European Union has included the false acacia in the list of invasive species to be eradicated, Hungarian Prime Minister Viktor Orbán fights for it. The Hungarians consider the species, which arrived from North America 300 years ago, to be their national tree. "Modest requirements for soil conditions, the rapid growth and the versatile use of the above-mentioned species were reasons for the black locust to become one of the most favourite trees for the Hungarians and it occupies almost a quarter of the total forest cover. That is why, despite the possible negative impact on the environment, it is an important tree. Moreover, it is exceptionally durable wood. However, it does not only bring benefits to the economy of the country, but it is also a source of inspiration for Hungarian writers and visual artists. Together with acacia honey the false acacia became a national symbol, included in the Hungarian collection of values Hungarikum," says Ján Balaj, one of the main programme curators of the Divadelná Nitra. Performers start a pseudo-political action based on the reality staging. By actions shifted to the border of absurdity, they "fight" for the black locust. Recordings of their real activity as civil activists, which form the backdrop of theatre production Hungarian Acacia, are projected over the theatre stage, which is covered with clay and full of plants. The example of devoted actions by creators is planting acacia in the middle of winter in one of the Hungarian national parks. They found that there was no single acacia in the whole park. "To understand this production, you do not need any special knowledge of botany; production does not concern environmental issues either. But it clearly points out how the various ideologies, which misuse the scientific facts in their arguments (excluded from the context), use the acacia tree to enforce their opinions or to justify their interests," wrote Kitti Gosztola, a Hungarian artist, about the production in Artmagazin. "In the end, however, the work of a group of young creators can be perceived in a much wider context. It is paradoxical that the national symbol of the country, where the xenophobic relationship to racial and ethnic minorities grows stronger, is an alien plant. Based on the example of the false acacia, creators are talking about ways of migration, inclusion and isolation, which are also related to the current negative attitude of a significant part of society towards the recruitment of migrants from the Near East," says Ján Balaj. Kristóf Kelemen, the leading star of the Hungarian theatre company, is at the forefront of a group of 5 performers. In his previous work, he has took part in various theatre projects – from classical and contemporary drama, through documentary and physical theatre, to opera, musical and performances with homeless people. The visual artist Bence György Pálinkás devoted himself to modern movements of fine arts. His interactive installation Multifilter, in which the viewer by his movement in the space turned on and changed the sound of individual stories from five televisions and sound channels, was also introduced in Kosice White Night 2012. Even the 50th anniversary of the occupation of Czechoslovakia by the Warsaw Pact troops is one of the anniversaries that have accumulated this year. The invasion of troops under the Soviet command was masked by the claim of fraternal help against the planned "counter-revolution". However, it interrupted the revival process of Prague Spring, whose avant-garde was also presented by Czech and Slovak theatreandthe flowering of all forms of the theatre throughout the country. While the memories of August 21, 1968, and the obscene years of normalization that followed evoke bitter feelings, the 100th anniversary of the establishment of a common Czechoslovak Republic should be a reason for celebration. This is why the International Festival Divadelná Nitra 2018 will offer a complete presentation of Czechtheatreas well as film in its programme. All the works of Czech creators the festival gathered under the project REpublic 100. Divadelná Nitra, which will start on September 28th and will take place till October 3rd,has the theme RE. "The theme RE originates in the accumulated so-called ’years with number eight’: 1848, 1918, 1938, 1948, 1968, 1989, 1998. Most of them are connected with the existence of Czechoslovakia," says director of the festival Darina Kárová. "They call for the need to look back, to think about past events, to re-evaluate the interpretation of history andour opinions.That's why REminiscence, REcapitulation, REvision... At the same time, they raise questions about our future actions, what should we do to avoid repeating mistakes of the past and cope with new challenges. That is why REstart, REvitalization, REcycling, REnaissance," she explains. The REpublic 100 project includes five scenic works of Czechtheatres and creators, each of which is addressed not onlyto children, but also to adult audiences, and ten films programme. 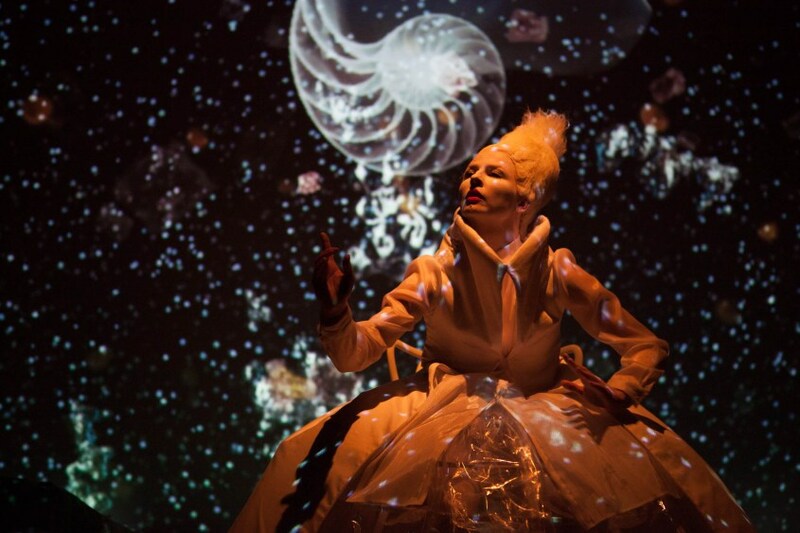 In the main programme, it will be an untraditional puppet show Bohemia Lies by the Sea.The theatrehall is immersed in a special darkness that is under the sea, the stage is losing clear boundaries, and poetry spreads all over the place, and fish and octopus come to life for every spectator. The production of director Michaela Homolová offers a miraculous combination of unusual poetry, painting and music. "The authors present spectators of all ages and experiences – the production is intended for children 6+, but the magic is also spontaneously spread among their parents and old parents, theatricians and non-theatricians – all of them enjoy the fantasy and magic of the underwater world," wrote the Czech theatre magazine Divadelní novinyafter the production was shown at the festival THEATRE Pilsen 2016. In the darkness of the hall you can see floating jellyfishes, fishes, sharks and flying whales. Around the audienceemergesounds of the sea and actorswhisperthe sea myth and inspired verses of Radko Malý with amysterious voice. The viewer cantouch everythingor comment onanything and this opportunity was frequently used bythe smallest in Pilsen. The production Bohemia Lies by the Sea will be presented at Divadelná Nitra by Naive Theatre, Liberec. The Naive Theatre has already hosted at the festival with their production The Little Swan Lake, which in 2011 was a part of Plus Festival. Moreover, their production About the Lamb That Fell from the Sky was shown in 2015 in the accompanying programme. The puppet theatreis also working withthe interactive puppet installation Puppetground, which will be offered during two afternoons at Svätopluk's Square in Nitra. Engaging children into acting is not only desirable, but also necessary. The author of the concept of the theatreproject Táňa Švehlová in Puppetground offers visitors the opportunity to play their favorite fairy tale by themselves. The performancefor the whole family resembles the baroque tradition of puppet theatres. Five original designs with different sceneryand a set of puppets change public space into an interactive park opened tothe actingand fantasy development. In the accompanying programmeof the festival, Karol Spišák Old Theatre in Nitrawill present the production of Alone and Esmeralda. The last premiere of the past season in the theatrewas prepared by the successful young Czech opera director Linda Keprtová. The Swedish playwright Martina Montelius has shown a treasure of imagination, which can be a way outof living life bound by limitations, based on the subject of child loneliness. Alone, his old mom with a mysterious football career and the famous circus artist Esmeralda are main characters in the production. While the Alone and his father are looking for a way of mutual understanding, the real world overflows with the world of fantasy. "The conclusion of the performance containsa strong humane message. As ifagreyimpersonal space is changing with a helpmagic wand intoa comfortable room. It is enough to containa table with a white cloth, a bouquet of roses inthe vase, and two understandingpeople – father and son," wroteatheatrecritic Marta Žilková forthe review of the performance. The festival will be hosted bythetheatre troupe HOP - HOP Primary Art School from Ostrov with another serious themeand again with a children's story, this time even shownby children. The drama performance Run, Boy, Run will be presentedin the accompanying programme ofDivadelná Nitra 2018 in the section Young Theatre. The director Irena Konývková with children-actors staged a bookwrittenby the Polish-Israeli author Uri Orlev. It is based on the true story of a 9-year-old boy who escapes from the WarsawGhettobefore the Holocaust, and has been hiding in forests and countryside infamilies for several years. He wouldexperience betrayal when the "rescuers"gave him up to the Nazi Gestapo, he would experiencetheheroic help,and in order to survivehe must pretend to be an orphan of the Catholic family. This work with the subtitle I Do Not Want You to RegretMe, It'sMeaningless is also looking for answers to the question of whether people's faith connects or divides, whether the admission of a person to the community is important, in what or who they believe, whether we can help a person in need, even ifhe is not one of us. At the beginning of August, she took part in the 88th edition of the Jirásek's HronovTheatre Festival. The cult Cirk La Putyka at Divadelná Nitra 2018 will present another interpretation of the new circus. Last year, their unusual Black Black Woods belongedamong the strongest moments of the festival. The new work entitled Batacchio was created together with the Czech colleagues by Finnish director Maksim Komaro, Divadelná Nitra presents this production asa final performance beyondthe curatorial selection under the title Festival EXTRA. And that it will really be an extra "gift" for the audience of Nitra, it will be possible to convince nearly 600 spectators in the great hall of Andrej Bagar Theatrein Nitra. The festival will also offer ten films of Czech and Slovak origin in the REpublic 100 projectin the Festival tentat Svätopluk's Square in Nitra. Among them there are documentary films such as The Lust for Power by director Tereza Nvotová, Milda by director Pavel Křemen, The Czech Way by Martin Kohout and My Unknown Soldier by director Anna Kryvenko. The shot Circus Rwanda by director Michal Vargawill be presented by Divadelná Nitra for the first time in Slovakia. Once again visitors will be able to enjoy the famous era of Czechoslovakian feature film of the 1960s. Teaser of Divadelná Nitra 2018! With a help of his artistic work Rabih Mroué crosses the boundaries of theatre potentiality. A dedicated Lebanese artist, who lives and creates in Berlin, will show his production in Slovakia for the first time. At the International Theatre Festival Divadelná Nitra 2018, which is held from September 28 till October 3. 33 RPM and a Few Seconds, which he created with his artistic and life partner Lina Saneh. 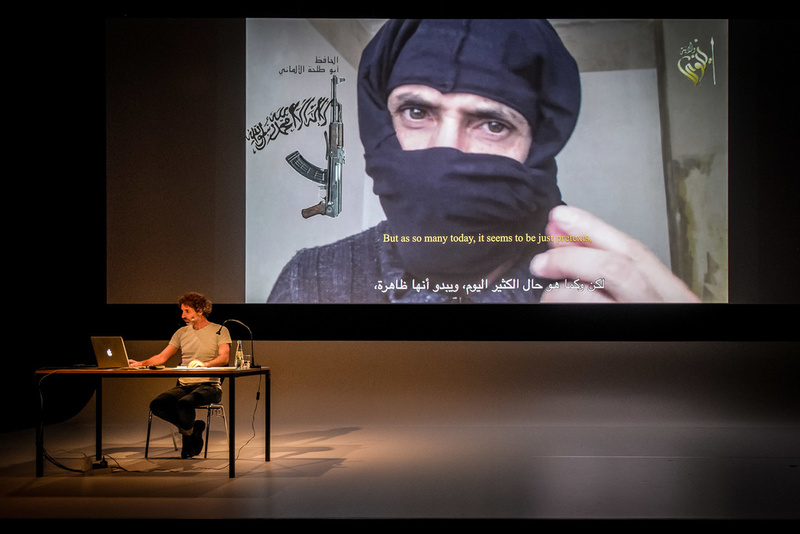 Rabih Mroué in his documentary performance examines not only the boundaries of the endurability of perception of killing, but also the world built on own displaying. The artist started to create this shocking artistic work for spectators on the basis of recruiting videos of the terrorist organization The Islamic State, whose aim was to find potential recruiters in Hessen, Germany. Sand in the Eyes is based on a semantic images analysis that addresses especially young people growing up in Europe and attacks the perceptual capacity possessed by a civilized man, displaced a violence from his world. At the same time, these images and their perceptions are confronted with the killing of terrorists by drones. Mroué, who performs as a lecturer himself in the production, brings facts and some fiction, asks questions, but leaves the audience to find answers. Instead of a cliché about terrorist propaganda videos, he focuses on the image war. In the interview with London Daily Sabah finally said that the war takes place on the ground, but the other one – in images. Event is not only for the young theatre critics from the V4@Theatre Critics Residency, and participants of the How to Understand Theatre project but also for public. Sand in the Eyes is the performance which is on the border with theatre, sociological studies, journalism, and activism, the production 33 RPM and a Few Seconds turns between theatre and visual arts. It crosses the expected boundaries of the theatre mainly by usage of special scenic means. Actor-free installation is a concert of communication tools – mobile, television and social networks. However, it reconstructs a portrait of a dead Lebanese activist, who has committed suicide, the theme highlights on the importance to examine the trace left by man after death in the digital world. 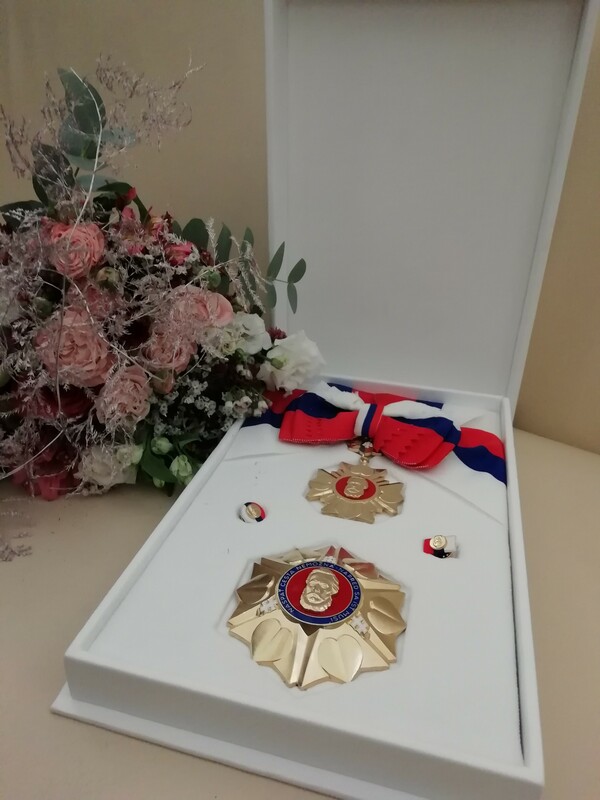 It appeared in the period of the so-called Arab Spring, Divadelná Nitra 2018 connected it with the term REconstruction. "The scene reminds you of the everyday situation behind the table: the viewer stares at the computer screen, updating Facebook messages, in the background there is a TV programme, and, meanwhile, the phone is ringing. This part surprisingly includes 70 minutes of production without a man appearing on the stage. 33 RPM and a Few Secondsis not just an artistic work about politicization and revolution in the Arab world, but also a reflection of media coverage of the politics, time and space," wrote American linguist from Austria, Leopold Lippert, for nachtkritik.de. Both productions created by Rabih Mroué, which will be presented at Divadelná Nitra 2018, primarily explore the modern world of young people and overlapping of reality with images and lives on social networks. The question is whether it is possible to separate the reality from its depiction at all or whether one of these – once two worlds – has become an indivisible amalgam. Tickets for Divadelná Nitra 2018 are already on sale! Tickets for International Theatre Festival Divadelná Nitra 2018, which starts on September 28th and will be held till October 3rd, are available for theatre fans already. Eight foreign and five Slovak productions and performances will be presented in the main programme. 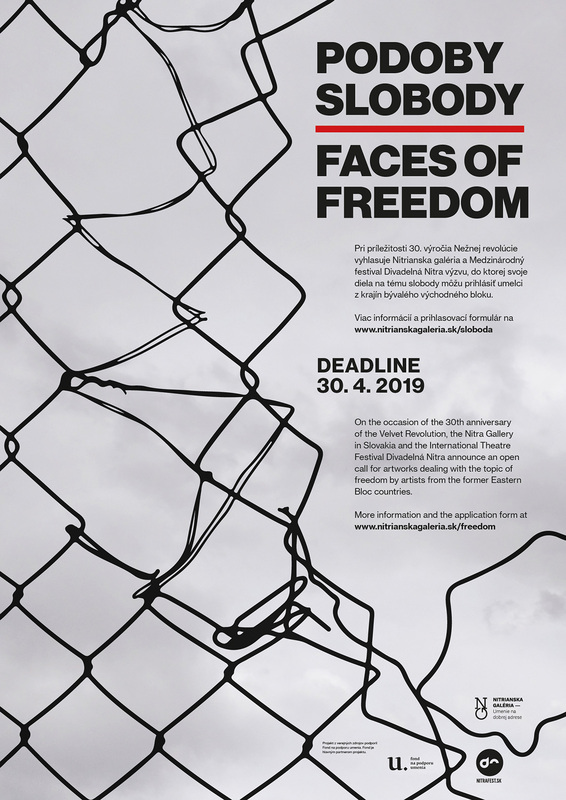 The theme of the 27th year of the festival - RE will be in various forms disclosed by theatre troupes and creators from Poland, Hungary, the Czech Republic, Portugal, Germany, the United Kingdom, Lebanon and, of course, Slovakia. Tickets are already on sale from August 6, 2018. You may purchase tickets online at http://www.predpredaj.sk in the section Theatre. Divadelná Nitra Box Office is opened from August 23, 2018 in the Andrej Bagar Theatre in Nitra, main entrance hall (access from the Svätopluk’s Square). Working hours: Mon - Fri 14:00 – 17:00. The festival traditionally offers discounts for all shows for students and seniors. The Category Profi can be used by theatre professionals and journalists to get a discount for shows. ZPP card holders have free entrance to performances. One of the most outstanding directorial stars in the neighbourhood, one of the most remarkable Polish theatre troupes, one of the most successful and discussed productions of the year in Poland. Michał Borczuchfor TR Warszawa adapted six volumes and about 3,600 book pages of the world famous best-selling series of Karl Ove Knausgård and merged it into a magnificent production about a man's desire for an ordinary life, that will solely open Divadelná Nitra 2018.
drones?The Lebanese-German conceptual creator tests (our) boundaries of the endurability of perception of killing. It connects the fictional world of media with REality of killing. It brings facts, asks questions, but answers have to be found by visitors, as well as their REaction to these facts may be different. What is it like when a story of someone you do not know will hit you deeply? Forexample, a Syrian refugee? How far can fingertips take a man? An intimate performance, where touch, music and story take always one person on a journey to encounter people of various fate, origin and confession. On the path of compassion and understanding. returns to Nitra. Though Bohemia Lies by the Sea was created for children from the age of 6, it will doubtless enchant all, who can appreciate a beauty. Night is a time of dreams and ghosts, but also of encounters with our own subconscious and ego.The Night is, from the perspective of three Portuguese performers and one DJ, the time for outsiders, who cannot belong to the society that lives during the daytime. That’s why the arena space created from a hundred tires on the stage will generate, with a help of the unique physical theatre, an exhausting fight for a better place in the world. What sort of trace do we leave in the world of digital technologies once we die?Theatre installation without actorsis the concert of means of communication – smartphones, TV and social mediaand also the RErecontruction of the portrait of a killed Lebanese activist. 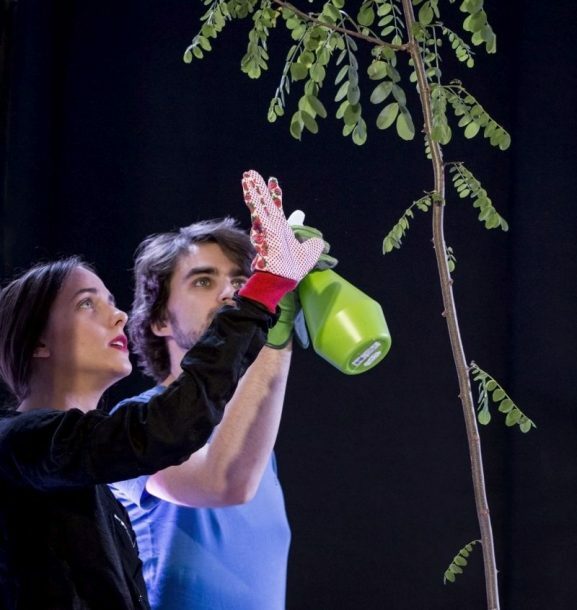 Can a tree become the subject matter of heated political discussion?The creative duo of the young stars of the Hungarian theatre scene bring a clear political theatre with a dose of irony and satire. It deals with the relationship of the Hungarian nation to the false acacias. Though the false acacia originates from North America North America, it has become the Hungarian national symbol and for Viktor Orbán a weapon against the dictate of the European Union. The flight of hundreds of thousands of people of Galicia reveals clear parallels with the current refugee crisis.The audience share an intimate space with five actors, cramped like passengers on a ship filled to the brim heading for ‘promised’ America. Their simple and moving stories are allowed to become all the more powerful. Cult Teatro Tatro with inimitable poetics invites for a visit to the mysterious ‘Zone’, where only illegal stalkers survive on their own. The Strugatsky brothers’ sci-fi classic comes to life at close quarters to the audience, making a visit to the Zone all the more enticing. Fragile coalitions and the germs of hostile moods arise between man and woman, just as they do between the two separated nations.26 mini-stories about human relationships, a rare actor cooperation, the text of a leading French author in the direction of a remarkable young Slovak artist. immediately forge into impressive scenic images. The powerful visual concept is saturated with the dancer’s movementsand comments on the will of a person to become not observer, but mover in world. The story of a young woman who ends up in rehab is especially engaging nowadays – it concerns many.With outstanding acting, a monumental scenography and a tragic dimension laced with humour, this play uncovers the dilemmas of the contemporary individual, the crisis of family, relationships, an absence of faith in God an in one’s abilities. Virtuosity of gymnastics and enthralling acrobatics, grotesque scenes and vaudevillian musical performances, astonishment at magic tricks and live audience interaction. In short, the REtro style of a traditional circus from 100 years ago joins hands with modern circus performance in all its variety under the baton of a Finnish director. Eight foreign and five Slovak productions and performances will be presented in the main programme of the International Festival Divadelná Nitra 2018. The curators chose them taking into account this year's theme - RE. The 27th edition of the most important international festival of performing art in Slovakia will start on September 28th and will take place till October 3rd. Polish production My Struggle, directed by Michal Borczuch, will open the festival. TR Warszawa has adapted Borczuch's best-selling series of Karl Ove Knausgård for one of the most important Polish theatre troupe. Six volumes and about 3,600 book pages merged into a magnificent production which is one of the most valued and disputable piece of work of the season in Poland. Opening evening is traditionally held on the main stage of the Andrej Bagar Theatre in Nitra. "A feeling of life on the edge, at the turning point, the need for a change of paradigm" is a moto of the project, which was one of the main resources of this year's festival programme. Again, anew, answer ".This is the basis for the title and theme of the International Theatre Festival Divadelná Nitra 2018 – RE", explains in the text of the project Darina Kárová, the director of the festival. " The key idea is to pay attention to the state of society and world, respond of the era, forecasts ". Michał Borczuchcomes back to Nitra after three years. When his Apocalypse opened the festival in 2015, it was a great success. In the original scenario, the issues of migration and inactivity were anticipated and it perfectly reflected the theme of Empathy - sharing and giving. The new production My Struggle is about trying to grasp the life that escapes from a man. He works with everyday situations and, in the same time, experiments with a theatrical form. One of the curators of the festival programme, Ján Šimko, compares this piece of work to famous Marcel Proust's In Search Of Lost time and adds, that the difference between these two pieces is that My Struggle is talking without metaphors. Within the thematic play with prefixes and syllables, the festival attributed the term REminiscence to the production. Divadelná Nitra will also offer other foreign productions and performances which lead to such terms as REactivation, REality, REconstruction, REaction or REpublic 100. 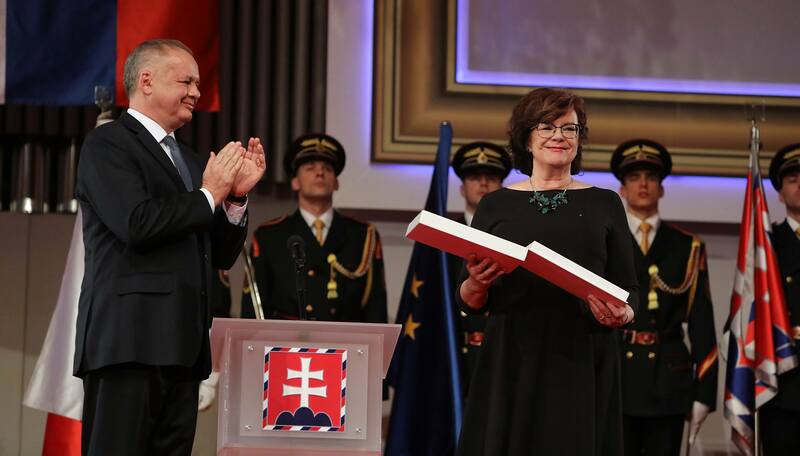 Darina Kárová believes that this year’s theme of Divadelná Nitra is connected with anniversary of so called „years with number 8“. They call for the need to look back, to think about past events, to re-evaluate the interpretation of history and our opinions. At the same time, they raise questions about our future actions, what should we do to avoid repeating mistakes of the past and to cope with new challenges in social, political, economic, environmental and private spheres so that we can begin to act differently - more friendly to each other and to the environment we live in ", she adds. The most rounded among anniversaries of so called „years with number 8“is the centenary of the birth of the Czechoslovak Republic. That's why under the term REpublic 100 Divadelná Nitra will offer two productions from the Czech Republic - for children and for adults. 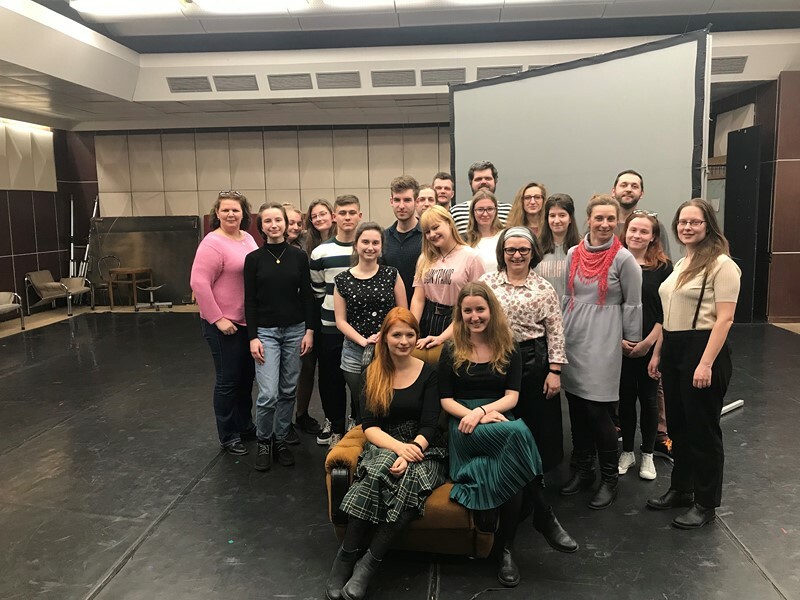 The Naive Theatre in Liberec will present the production Bohemia Lies by the Sea. Unconventional puppet theatre, directed by Michaela Homolova, takes place in the shadows of the sea world. The audience, and not only children, for whom this performance was primarily created, are, during the extremely impressive performance, part of the scene, and the whole theatre hall is taking part in this scene. Here is the miracle of uniting unusual poetry, image and music. Cult Cirk La Putyka is coming back with another interpretation of the new circus. Last year, their non-traditional Black Black Woods belonged to the strongest moments of the festival. 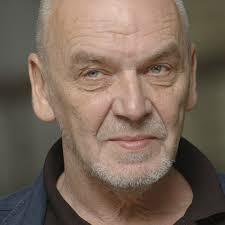 A new piece under the titleBatacchio was created by Finnish director Maksim Komaro with famous Czech creators. Divadelná Nitra will present it as the final performance beyond the curatorial selection under the title Festival extra. The Portuguese company Circolando also works with elements of the new circus, including the enormous physical power presented in the production Night. The arena space created at the Andrej Bagar Theatre in Nitra from a hundred tires will generate a special atmosphere and enrich the physical theatre, exhausting fight for a better place in the world and a better life. The Night is, from the perspective of three Portuguese performers and one DJ, the time for outsiders, who cannot belong to the society that lives during the daytime. This is the reality created by duo of directors - André Braga and Cláudia Figueiredo. 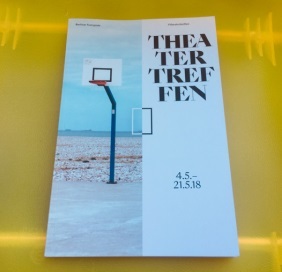 The boundaries of the theatre and the possibilities of using non-theatrical elements in the theatreexplore practically all the productions and performances that Divadelná Nitra has included this year in the main programme. Two of such productions will be presented by conceptual creator from Lebanon - Rabih Mroué, who lives and works in Berlin. His documentary performance Sand in Eyes examines the boundaries of the endurability of perception of killing. Through the fictional world of media and cinematography, spectators will be able to get some insights into the murder committed by the terrorist organization The Islamic State, as well as the killing of terrorists by drones. Moué brings facts, asks questions, but answers have to be found by visitors, as well as their REaction to these facts may be different. In the production 33 rpm and a few seconds Mroué, in tandem with Lin Saneh, examines the trace left by man after death in the digital world. Actor-free installation is a concert of communication tools - mobile, television and social networks REconstruct a portrait of a murdered Lebanese activist. Here should be also mentioned experimental but also intimate, essentially installation performance As Far As My Fingertips Take Me. It appears in the main programme of the festival with the connection to the term REactivation. Young Lebanese "live" artist and performer Tania El Khoury, who lives in London and Beirut, processes in this production feelings of immigrants, that she has also experienced by herself. The exclusive performance is presented in a 15-minute loop always only for a single viewer. The REaction to the political context is, after all, also a game with REality - the pseudo-political action of the Hungarian Acacia. 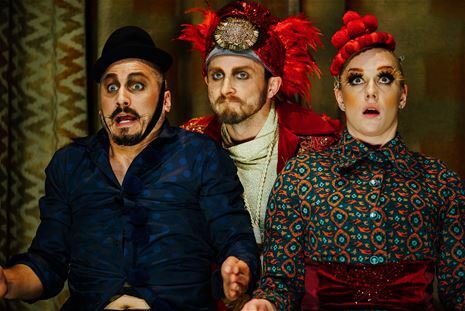 Creative duo of the emerging stars of the Hungarian theatre scene - Kristóf Kelemen and Bence György Pálinkás – with a help of satire study the marketing struggle of Hungarian Prime Minister Viktor Orban with the European Union. The creators in the real-live records deliberately push the struggle for the acacia, that the Hungarians consider to be their national tree, on the brink of absurdity. It arrived to the Central Europe from North America 300 years ago, and the European Union wants to eradicate acacia as an invasive plant. The pure political theatre is full of humour. Not only Jan Šimko selected foreign productions for the festival, but also other members of Artistic Board of the festival: Dáša Čiripová, Martina Vannayová and Ján Balaj. The Slovak performing artat the 27th edition of the International Theatre Festival Divadelná Nitrawill be represented by: The Re-unification of Korea (Júlia Rázusová, The State Theatre of Košice), American Emperor (Iveta Ditte Jurčová, Studio 12 & Pôtoň Theatre), Stalker (Ondrej Spišák, Teatro Tatro), WOW! (Jozef Vlk & Stanislava Vlcek, Debris Company). The curators of the Slovak part of the main programme of the festival are members of MLOKi, theatre critics Zuzana Andrejcová Ferusová, Katarína Cvečková, Lucia Lejková and Martina Mašlárová. The hosting Andrej Bagar Theatre in Nitra will present their production People, Places and Things (Marián Amsler). Moreover, Karol Spišák Old Theatre will welcome spectators to its production Sam and Esmeralda (Linda Keprtová), which is included to the accompanying programme of the festival. Ticketsto all productions of the 27th edition of the International Festival Divadelná Nitra are on sale on-line from August 6, 2018. Furthermore, you will be able to buy tickets at the festival box office at Andrej Bagar Theatre in Nitra from August 23, 2018. In addition to the main festival programme, there is also a rich accompanying programme for children and adults in sections: Festival for children, Young Theatre, other square, REAgora Nitra. Theatre productions, movies, concerts, exhibitions, reading, debates, workshops – all these events with the theme -RE will take place not only in Andrej Bagar Theatre in Nitra, Karol Spišak Old Theatre in Nitra, but also on the premises of other cultural institutions, as well as in the Festival tent or in the Svätopluk'ssquare and the adjacent streets. and the Mayor of the City of Nitra Jozef Dvonč. 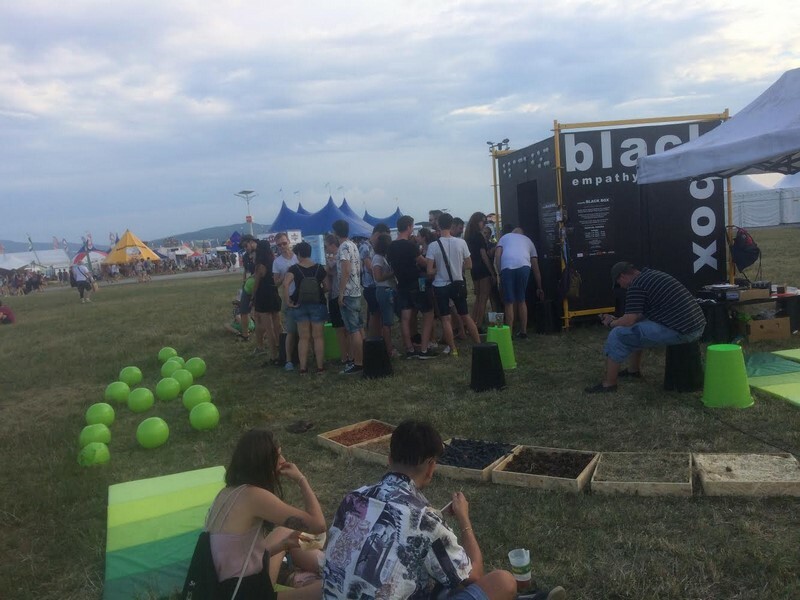 Empathy Black Box – installation of the A Tulip for You Project led by academic sculptor Elena Kárová, enjoys the rich attendance of Pohoda 2018 visitors! In absolute black cube, visitor can try the morning of a blind man. The project also includes a sensational walkway and a flower bed for the blind. What is the feeling of not seeing and not being cool on Pohoda? 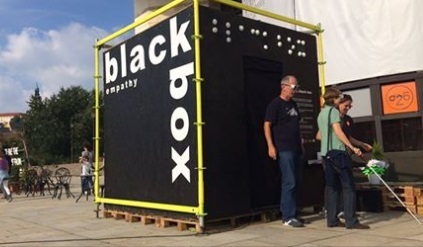 Unique installation of empathy Black Box brings a shocking experience of the daily life of people without eyesight. And for the first time, they will focus on the Pohoda music festival, which will take place from 5th to 7th July at the airport in Trenčín. In addition to concerts, discussions, and accompanying programme, visitors to the festival will be able to try something unusual. In the black space of the cube called the Black Box they are covered by the full darkness. "Visitors of the Black Box will find themselves in a different world. They will experience one morning in the dark, they try to cook tea or coffee, and spread butter on the bread. The black cube come out with a new look at the world of the blind,” describes the project author, acad. sculptor Elena Kárová. "It's a shocking experience for all, but a valuable way to bring two worlds together and to make people to be more sensitive. That is why the word of "empathy". "Spectators" can also try walking with a white mallet or get acquainted with Braille, Picht's typing machine, or a level meter. 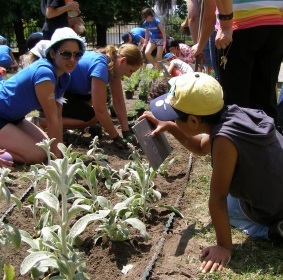 They can walk barefoot along the pebbles, grass or bark of the Sensory Walkway, identify the aromatic plants of the Flowerbed for the Blind and try to spin on a pallet blindfolded. After successful presentations in shopping centers, in front of the commercial companies in Bratislava and Nitra and especially in front of the Andrej Bagar Theatre during the International Theatre Festival Divadelná Nitra between 2015 and 2017, the interactive object moves to the biggest festival in Slovakia. Invitation to Pohoda 2018 is a unique opportunity to address a hundreds of empathy taught adults and children in one place, to engage them with their fate and make a desire to help them. The project A Tulip for You annually involves other minority groups in its events: mentally handicapped children, Roma children and children of Iraqi asylum seekers. It cooperates with the School for Visually Impaired Visually Impaired School in Bratislava, with Prince Pribina Primary School in Nitra, as well as the Room and the Good – Refugees Relief and with other non-profit and commercial partners. But without the help of enthusiasts – the volunteers – would not even A Tulip for You Project or the empathy Black Box could work. After the May trip to the Theatertreffen, which is the most popular theatre presentation in the German language area, we live full of the Austrian Wiener Festwochen festival. Within the EU-DNA III project (European Debate and Network Activities) we are making tours not only in Slovakia, but also on interesting foreign events and meetings with important partners. After the May trip to the Theatertreffen, which is the most popular theatre presentation in the German language area, we live full of the Austrian Wiener Festwochen festival. The closest we will go to the Nordic countries for the theatre in Helsinki. The EU-DNA project is supported using public funding by Slovak Arts Council, main partner of the projects. Members of Association Divadelná Nitra gave their vote! On the last day of May, members of the Association met on the premises of Academy of Performing Arts in Bratislava to summarize the activities of the Association and at the same time discussed its future. Besides, the most important issue was the election of new members of the board of directors and members of the ADN supervisory board. These are members of the board of directors chosen for the next four-year term: Lujza Bakošová, Slavka Civáňová, Dáša Čiripová, Katarína Figula Dudáková, Darina Kárová, Ján Šimko a Soňa Šimková. Among the members of the board of directors, Sonia Šimková was re-elected as chairwoman of the Association, Darina Kárová as the executive director, Ján Šimko became the vice-chairman of the Association. The supervisory board will be represented by Svetozár Sprušanský, Eva Hlaváčová and Ivan Gontko, who was also chosen as chairman of the supervisory board. Congratulations and we wish the Association a lot of success in the REalization of all projects. Members of the cultural organization MLOKi participate in the organization of Divadelná Nitra 2018 with the subtitle RE. Zuzana Andrejcová Ferusová, Katarína Cvečková, Lucia Lejková and Martina Mašlárová were chosen to be curators of the Slovak part of the main programmeof the festival. The association, which is known as the publisher of the internet magazine about culture, was created at the initiative of young critics of theatrical art, whose aim is to search for new opportunities for REflection and popularization of the theatre criticism. The final list of selected Slovak productions will be known after the festival Touches & Connections in Martin. Summer is coming and it is the best time for parks and gardens. A flower bed for visually impaired children, which was created by A Tulip for You project on the premises of Primary School for Blind and Visually Impaired Children in Bratislava on Svrčia Street, will get a new, better form on June 15, 2018. In collaboration with volunteers from Deloitte, company which supports the project for the long period of time, children with health problems will be involved in REvitalization of the premises where they live all year-round. Academic sculptor Elena Kárová, the coordinator of this event and project A Tulip For You, explains that visually impaired children recognize plants by touching and smelling, which is vital in their handicap. Moreover, each species is given its name in Braille.